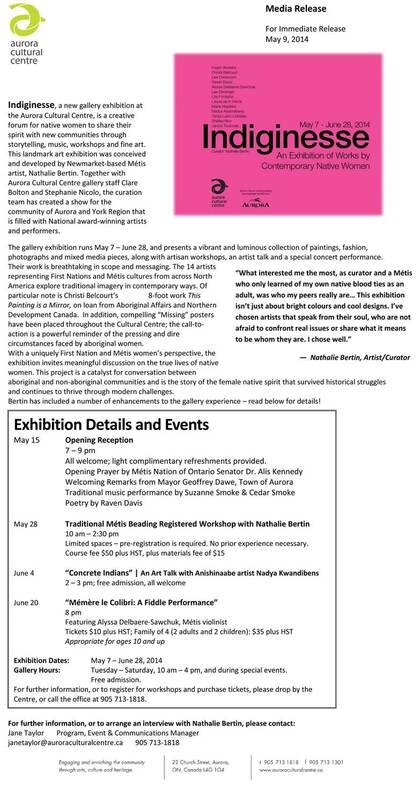 Artist statement: "Indiginesse is a culmination by valiant, contemporary Native women artists working to offer healing, education, and to inform all communities. May this exhibition bring greater compassion, understanding, health, and peace as we all seek to offer responsible caring towards all of our many communities." "The first question I’m usually asked about Indiginesse is what inspired me to create this project? My first answer is always that I wanted to know who my peers are. Having found out about my own indigenous heritage later in life, I had a lot of learning and catching up to do. In doing so, I also realized that a lot of Canadians simply don’t know much about the indigenous cultures that surround us outside of old history books. And so, when thinking about how I was going to develop this project, I decided to use tradition to talk about the present. I chose women artists because many First Nations traditions are matriarchal and the women were responsible for passing on much of the culture to the young ones. I chose contemporary artists who not only create aesthetically pleasing work but could also speak to who they are, what matters to them, today - in the present time. When the IdleNoMore movement (initiated by a group of indigenous women, by the way) started gaining ground, I realized I was not only on the right track but that, now more than ever, we need to start having discussions between indigenous and non-indigenous Canadians, outside of parliament, away from the media sound bites, so that we could create better understanding among us all. Ultimately this exhibition isn’t about me. It isn’t only about the artists either. It’s about all of us, indigenous and non-indigenous people, coming together to learn from one another, to bridge the gap that currently exists between us, so we can move forward on life’s journey - together." Concert performance premiere of "Memere le colibri"
(June 20, 2014) Question & Answer session during the intimate evening with Metis musician Alyssa Delbaere-Sawchuk. The second half of the concert performance featured the remaining members of the Metis Fiddler Quartet.